Despite the claims of its leaders and proponents, Wednesday’s rollout of the first draft of UCOF recommendations reveal that far from being “a brave first take” as President Yudof would have it, the Gould Commission threatens to throw the University into a headlong embrace of the most conventional assumptions of a public philosophy that has led the United States into economic, political, and social crisis. At precisely the moment when the decades long denigration of public commitments in favor of private interests has led to profound economic crisis, when the high-tuition, high-aid model in higher-education has proven unable to sustain wide-ranging access, when the effort to reduce value to a question of marketability has revealed its larger implications in failed schools, cities, environmental degradation and growing inequality, the UCOF process proposes to remake the University in the name of market efficiencies. Rather than breaking with past UC practices, the concrete proposals of the Gould Commission would simply entrench the shift from public support to private fee, the disengagement of research from teaching, and the expansion of the non-educational sectors of the University. To be fair, there are things to applaud in the workgroup reports—signs of individuals’ efforts to push back against the narrow framing of the UCOF process. For one thing, both the “Access and Affordability” and the “Funding Strategies” reports make clear the absolute centrality of state support for the University. Indeed, the Working Group reports challenge the often-repeated assertion that UC must accept the reality of declining state funding and rely more and more on private and individual contributions in order to survive. Instead they demonstrate that UC’s leadership’s acquiescence in declining state support and plans to compensate on the backs of students is doomed to failure; even without the obvious ethical and political problems the funds would never be sufficient for the University to flourish. Instead of this passive acceptance, the Working Groups recommend a much more active and consistent effort to regenerate public support and public pressure in favor of the University. For another, both the Funding and Research Working Groups have made clear the extent to which core funds have been underwriting external research in the University for decades. The reports offer a variety of plans to try to raise the rates for Indirect Cost Recovery—proposals that would generate large sums of money. The Research Working Group has acknowledged the importance of breaking down the insidious distinctions of the value of research based on funding opportunities, and recognized the various ways that research remains a public good. The “Access and Affordability” Working Group in particular emphasizes the centrality of the commitment to access to the University and the need to acknowledge the University’s uneven success in meeting that commitment. In particular, they ask for a reaffirmation of the University’s promises to California’s High School graduates and of the University’s responsibility to disadvantaged students. Finally, several of the Working Groups recognize the importance of a serious effort to re-engage the Federal Government in the support of the University in the widest way—and not simply in the support of discrete research projects. While welcome, many of these statements of commitment bear little relationship to the practical heart of the Working Group recommendations. 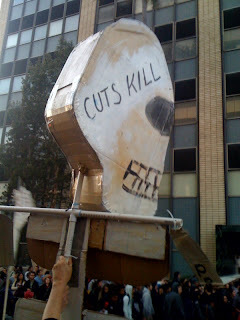 Instead, the substantive proposals to confront the budget crisis all continue well-established, internal UC practices. Rather than an effort to rethink the way that the University operates or conceives of itself, or a meaningful effort to restore the public heart of the institution, the UCOF proposals simply intensify trends that have been in place for the last decade—trends that have contributed to the depiction of higher education as a private service rather than a public good. For all of the laudable rhetoric about the importance of public support and funding, and despite the important recognition of the distorting and damaging effects of the structure of ICR, the “Funding Strategies” report, as Chris has shown, centers on a dramatic increase in student fees (renamed tuition) as well as an expansion of out-of-state students. These proposals could eventually double the costs for instate students and raise those for out of state students to nearly $40,000. Yet even with these numbers (and with the expansion of out of state students) the rise in fees would not cover the recent cuts in state support. Just as importantly for the long-term character of the University the logic of these fee increases—or at least the logic of how to calculate them—is done solely according to the elasticity or non-elasticity of demand. Put another way, the calculations being proposed are not based on a project of making the University as accessible as possible but rather on one designed to raise costs as high as possible without losing consumers. By the same token, despite the powerful restatement of the rhetoric of opportunity in the “Access and Affordability” report, the history of high-tuition, high-aid programs demonstrates that access is in fact lessoned considerably. The percentage of Pell Grant recipients at the University of Michigan, to take only the favorite comparison institution, is little over half the lowest percentage in the UC system (UCOF, 96), while the University of Virginia to take another favorite comparison has lower percentages than Michigan. Moreover, while the Working Groups bravely insist that there should be a new contract with the state the historical evidence strongly suggests that raising fees simply allows the state to lower its support for core programs. Again, put another way, rather than a departure from the practices that have landed the University in its present fiscal crisis, the tuition model will simply exacerbate them. Not surprisingly, the contradictions of the recommendations are clearest in the “Educational and Curriculum” Working Group’s report. Rei Terada has effectively dissected this report so I will not belabor all of it. As she forcefully demonstrated, the systematic effect of their report is to ask students to pay more for less: encouraging the “buying out” of senate faculty and their replacement by lecturers and graduate students, pushing to expand online programs despite their checkered history, finding ways to shorten time for degree in exchange for a decline in student options, etc. But even more striking is their diffidence in defending the notion of a quality education. As the work group puts it (49); “The Education and Curriculum Working Group believes that maintaining the quality of UC undergraduate, graduate, and professional education at the highest levels possible should be a top priority.” “Believes”? “Should be”? “A” top priority? Compared to what? Are there higher priorities for the Working Group? Why such diffidence? Leaving aside the question of defining “high quality” the report seems to confirm what many fear—that there are forces within the University who believe that educational quality (which UC has always insisted includes teaching and research) is not “the” core priority for the University. In fact, this diffidence gets to the heart of the problem with the UCOF process. The Working Group reports are filled with the language of “inputs” and “outputs,” “best practices and efficiencies,” “metrics” and “value-added,” “elastic” and “inelastic” demand. Of course, who could be opposed to “best practices”? But “best practices” and efficiencies” to what end? If the aim of a fee system is to maintain the widest possible access then the best practice is different than if the aim is to raise as much revenue as possible without losing consumers. If the aim of efficiency is to lessen administrative costs then the best practice will be different than if it is to cajole or compel faculty into more uniform departmental practices. If the goal of a course is to create a repeatable commodity that can be viewed individually at any time while earning revenue for the University then the best practice will be different than if the aim is to provide opportunities for students to learn from each other’s questions and engage in a give and take with a teacher. If the aim is to give priority to funds coming from external grants and fee for services then the best practices will be different from emphasizing the shared core programs and responsibilities of the campuses. Remarkably, the questions of what the University is for are barely touched upon in the Working Group reports. Instead of an evaluation of purpose or a searching discussion of the place of higher education we are overwhelmed with languages more appropriate to a cultic bowing down before the Gods of Accountancy. But as has been pointed out so often, the Gods of Accountancy may teach the price of everything but they teach the value of nothing. If we approach all questions through the lenses of managerial logic and markets we will only get answers in the logics of managerial calculations and markets. But it is that logic that has devalued so much of what makes the university worth defending—and life worth living for that matter. And so UCOF proposes to continue and intensify attitudes that have helped create the crisis in the first place. Despite all of the rhetoric, we are not witnessing administrators making “hard choices” (it is always interesting how their hard choices tend to hurt others rather than rebounding on themselves) but a pretense of new departures and imaginative approaches to the future. Indeed, UCOP shows no indication of resisting the prevailing finance and market mentality. In supporting the online proposals President Yudof remarked that “'In the long run, (expanded online instruction) will happen at one of the great research universities,' .... 'It's just a question of when. I'd like to see UC play a leadership role.'" But this statement does not mark UC as a leader but as a lemming. We must do it because someone else might; we wouldn’t want to miss out on market share after all. But what if the spread of online courses had more to do with profit margins than with educational opportunity? What if the purpose of education was less the capacity to absorb knowledge than to think about it critically and in dialogue with others? But what if the University actually acknowledged the damage that has been caused by the reduction of values to market share? What if it refused the misapplied realism that has devalued the public and the community? The time has come to refuse the false wisdom of Christopher Edley when he dismissed the “consultation process which typif[ies] the University” while insisting that “budget discipline comes from the top-down.” I would insist that contra Dean Edley “we cannot afford [not] to go through the normal consultative process” and that the last thing we need is a “more muscular central system” when we have no idea what values—other than economic efficiency--guide the administrators. Ironically, what Dean Edley would give us is the worst of two worlds—the primacy of vacuous notions of market efficiency and the undemocratic imposition of central planning. It would be as if we combined the worst of high-modernist city planning with the worst of the financial industry’s denigration of long-term sustainability in order to protect the lack of transparency and growing inequality in the institution. Such a combination would prove lethal to a community devoted to open inquiry, research, and teaching. We are clearly at a crossroads in the UCOF process. The first round of recommendations is precisely that—a first round, a testing of the atmosphere. If the faculty sits back instead of arguing back the Regents will reinforce the trends that have helped bring about this crisis while exploring new means to shift the UC away from being the foremost public higher education system in the country. People need to speak out in whatever forums they have. And they need to so without delay. was ever an organizational form devoted entirely and fundamentally to innovation and change, it is the form of the university. No other organization in the state of California has a comparable mission: to enhance the life of all citizens of the state through teaching, research, and service. Of course the Commission had to have representation from all 10 campuses and from the vice-presidential level at the system headquarters: a university is decidedly not an organization defined by its central management. This was acknowledged from the outset by voices from the President's office and from campus leadership. Try single-handedly mandating curriculum changes, policy changes, risk management changes, fiscal changes, or whatever you would like to try: it cannot legally or practically be done without full consultation. Academic freedom and shared governance are enshrined in the rulebook, and for very good reasons. They are major factors in what makes any university great. Unfortunately, this is easily forgotten. Nonetheless it is an integral part of higher education, and a primary reason for the success of universities over the past several centuries. Yet celebrating this also means acknowledging the complexity that results. For such a complex system, an unprecedented process like this Commission on the Future poses a daunting data-management problem. One can only imagine the amount of emails, phone calls, agenda items, attachments, proposals, memoranda, policies, and comments distributed across dozens or hundreds of computers. Even if one surmises that the collectivity of such documents is thus organized in arbitrary ways that certainly mask some redundancy and cross-reference, one can safely assume the amount of sheer data - numbers, excel sheets, longer and shorter texts, graphs and curves - is not fully represented in the voluminous PDF of recommendations the Commission posted online yesterday. In turn, the Commission's own structure, with a steering committee coordinating five working groups whose total membership goes into three figures, is only an approximation of the kind of collective effort that must go into helping to run an organization as complex as this large public university. The apparent hierarchy of the Commission masks a structural need to involve multiple lateral levels, muc in the way the operational management of the university seeks to mask the complexity of the academic enterprise. One may go further and bet that comments, responses, and rehashed as well as new proposals are even now inexorably accumulating within the noisy channels of shared governance. By "noisy channels" I do not mean that the Commission's work, the central administration's staffing support, or the Academic Senate's activities are mere gossip or background - on the contrary, they are in fact crucial to the operation of the University, with powers explicitly delegated from the state via the Regents to the faculty. But it is clear that these days especially, educational assessment, administrative accountability, research support, and other aspects of any academic enterprise are intensely data-driven. The question about "noise" is how, and at what point, such an accumulation of data, such a steady flow of phone calls, webcam conferences, emails and other online encounters, turns from sheer quantity into quality. At what point do data enable decisions, formal recommendations? This question must be rephrased as a question about defenses against complexity. For the faculty members and administrators involved, the sheer amount of data is enough to overwhelm every hour left available between student contact hours, lecturing, preparation and grading, and other such routines and mandatory frameworks of the academic year. Systems theory describes this sort of management as producing the distortion that brings a complex system into equilibrium. The conditioning that the noisy channels of shared governance (shared between campus administration and faculty members) introduce is preferable to the overwhelming complexity of the system's raw data feed. It is an illusion that an organization as complex as a 10-campus university (each campus composed of schools division, and they in turn organized in departments, but with a flat hierarchy that affords few controls) could ever be directly administered centrally. Indeed the opposite is the case: central administration might wish to portray itself as the direct cause of certain institutional effects we observe, but they actually cannot affect such change directly (I will spare us all a long list of empirical historical illustrations here). The illusion is maintained in order to communicate to the large organization a vision of itself - but it is an impotent vision that strips away the noise, the essential complexity. This pleases many of us in its simplicity, although we may well intuit how inaccurate it is. The levels of central management that appear to control the university's operational functions certainly have more direct influence over the corporate auxiliaries and profit centers at the margins of each campus - housing, parking, medical centers - but such hierarchical influence is felt far less in the main campus areas, where general management is de facto and de jure a matter of shared governance within the legal framework of the institution. Of course there are lots of controls in academia - internals levers, ranging from curriculum committees to peer review of proposed publications, and external limits, ranging from limited and shrinking higher education budgets to the quality of the high school education incoming students bring to the table. But largely their contribution to the complexity of the mission of the university is irreducible - they cannot be "managed away". Management in any kind of large organization is confronted with complexity. Operational management refers the uncertainty of appropriate ends and useful means to economic markets. General management refers the necessarily resulting internal tensions to modalities of the organization. Corporate management refers the allocation of power and influence to the social and political challenges of our times. In each mode, management is not just a way of coping with uncertainty, but also a way of cultivating uncertainty. It is clear to most observers of higher education that university management is assuredly not a reduction of short-term questions to the most efficient response. There are no case studies in MBA courses on total control of an academic institution. Inversely, the axiom that we "do not already know" is a fundamental academic virtue. By emphasizing this as an intrinsic defense against over-stimulation, we may cast shared governance itself in a defensive role - and we do so advisedly. Campus administration and the Academic Senate must play defense: not only because there are some perverse voices on the Commission who get a rise out of portraying academia as hide-bound and in need of some simple and long overdue change-management (sell the buildings, fire the faculty, outsource teaching to online distance education) - certainly there are always going to be some resentment-mongers, given today's political spectrum in California. Yet at any given moment, and even in the best of times, proper shared governance necessarily overwhelms. All administrators and faculty members know this and can attest to it. Whether one believes that this is because administration is bloated, or because few unpaid volunteers among the professoriate pick up the slack for the many faculty who avoid such chores, or because the university has always been in the idea business and thus all sorts of ideas are always bounding around: the fact remains that shared governance confronts all participants with considerable complexity. (In fact, if one forcefully inserts into an organic organizational system an unprecedented mechanism like the UC Commission on the Future, it can easily become a magnet for bad and previously rejected ideas, as is evident from some of the recommendations the Commission discussed publicly yesterday.) This kind of organizational complexity can neither be fully controlled nor fully understood, it can only be managed. and the Academic Senate, it is a great quote. It is great in the way Edley's colleague Yoo provided history with great quotes about how inconvenient international treaties about torture are to those who desire greatly expanded authority. (But if we wished to amuse ourselves with cartoonish ideas of Edley cast in the role of Kissinger to Yudof's Nixon, central casting would correct us and point out that perhaps it is Yudof who resembles quick-witted and jowly Kissinger, while Edley's public persona may recall Nixon's bundle of resentment and authoritarian ambition.) More to the point, the inoculations offered by Commission members like Edley will boost the university's defenses. Even the most casual observer of higher education knows that online delivery of courses has in fact lost dozens of universities million and millions of dollars each. It works well for some forms of training and testing, but it is not education, even the most populist critics of US universities acknowledge as much. So it may be a good thing in times of crisis to force the institution to recall its core virtues, and to communicate them back to its central administration, even though the ranks of Yudof's advisors are oddly thin on people with a solid grounding in a main campus research discipline. Perhaps one unspoken recommendation issuing from the Commission is that the President's office must not rely too heavily on professional school faculty. For the Commission to be successful, for the UC to succeed, the challenge is to involve enough people from the very core of enough campuses, instead of letting a few ill-tempered outsiders who have yet to acculturate to main-campus academia ruin the institution. For instance, one cannot (and indeed must not) recommend fiscal changes without understanding the historical, piece-meal evolution of the university's funding; and there are major inequities and grandfathered differences that compounded over decades that UC must rebalance before anyone even begins to discuss differential student fees by campus or major. Likewise, there is award winning competence in risk management on some campuses, and this know-how should be shared and understood before another campus obliviously claims to have hired the right consultants that will enhance the university's efficiency. Vague claims about potential administrative efficiencies run the risk of ridicule if they remain unquantified; more importantly, they certainly should not be generalized from one campus to another (let alone from a fat campus to a lean campus). The press keeps reporting about administrative bloat in state government and in the state's education sector, yet none of the UC Commission's work groups took it up. The compensation scandals in the office of the UC President have not been forgotten; scandals in the UC medical centers have not stopped. Perhaps only the state audit of the UC can yield a clearer picture of this complex system's budget. Meanwhile, it is equally obvious that the bulk of our politicians do not value the state's research university system any higher than they do their own community-college alma mater. UC was once the envy of the world; circumspect planning for our public university's future to remain so is appreciably complex. And for that reason alone, it cannot be left to those who cling to bad ideas from the dot-com boom era. The proposals offered by UCOF this week quite literally ask students to pay more for less instruction. How to get them to pay more is covered under the funding recommendations; how the UC might deliver less instruction is covered in the section called “Education and Curriculum,” which will be my focus below. I’ll try to give an analytic summary of this 25-page section (pp. 29-54), as well as to suggest some larger concerns that emerge from its reading. (1) The first set of Education and Curriculum recommendations (pp. 29-35)suggests moving students through degrees faster, for example by raising average credit loads, changing or “streamlining” requirements, and increasing summer and cross-campus enrollment. This set of proposals includes possibilities that could benefit students by facilitating graduation; transfer credit, for example, might be treated less bureaucratically, and major requirements could become more practical to fulfill. In a system so revised, however, students may also have less leeway about when to take courses, tighter add and drop deadlines, and more regimented courses of study. Further, another goal is to get them to graduate with fewer UC courses all together, through increased use of AP, high school, and community college credits and by lowering the total number of units students may take. In an obvious sense, a three-year B.A. gives less UC experience to the student even as fees are desired to rise. In addition, the UC courses students do take would be less likely to be taught by ladder faculty. For the recommendations wish to “make more effective use of faculty resources” (29), or, bluntly put, to pay less to get courses taught. The working group suggests “extend[ing] the use made of research grant funding to buy out ladder faculty from instruction” while deploying lower-paid lecturers and graduate students to “backfill” the gap (29). In this all-too-appropriate construction metaphor, ladder faculty are removed by excavation, while lecturers and TAs are the gravel you scrape back into the hole. The “fiscal implication” of these recommendations for “the state and the University” is to “reduce the cost per degree . . . by efficient use of campus facilities and instructional personnel” (31), and the long-term “implementation method” that corresponds to this suggestion is: “consider changes in mix/type of faculty deployed to various courses” (32). So, savings are realized by channeling students and faculty into non-UC courses, summer sessions in which ladder faculty are paid less per course than in the regular academic year, and by using cheaper labor. The supposed benefit to students is that by graduating earlier, they will “have the opportunity to reduce their total costs”--costs that need reduction because the Regents are raising them even while continuing to lower the cost of the instruction they are receiving. It's well-known that instruction is the only part of the UC budget, in distinction to capital and administration, where expenditures have been on a downward course. On the educational level, to ignore the implications of “changes in mix” of teaching staff is to refuse to recognize that top universities maintain their reputations by maintaining students’ access to tenure-track faculty. On the level of labor relations, graduating students on the basis of fewer courses necessarily reduces the ranks of ladder faculty, not just while they’re off doing research but structurally and permanently. The ladder faculty’s ability to shape the UC would be eroded by emphasis on lower-paid temporary staff and graduate students who are not voting members of the Academic Senate and are excluded from the job security and governance rights of regular faculty. And that in turn would make it easier to accomplish further corporatization. (2) The second set of Education and Curriculum recommendations (pp. 36-39) advises the UC to “continue timely exploration of online instruction in the undergraduate curriculum, as well as in self-supporting graduate degrees and Extension programs” (36). This recommendation is linked directly to the first set in that online instruction would facilitate cross-campus, high school, and community college enrollment in UC courses and hence students' graduation with fewer UC courses. In addition, lucrative post-baccalaureate degrees offered online could “generat[e] revenues that support the University’s educational mission” (38; online courses are already offered, for example, by UCLA Extension). The possible impact of expanded online instruction on student access to faculty and on the faculty as a labor force is plain enough. The recommendation is presented somewhat gingerly, in the consciousness that people are likely to regard online instruction as inferior. The working group therefore stresses that the pilot project of 40 online courses currently being coordinated by the Office of the President be treated as a chance to evaluate the quality of online courses (36; while this is not the place for a discussion of the social science of educational assessment, what constitutes valid assessment is clearly an issue). In this section “Faculty concerns, e.g., about academic quality, workload, ongoing institutional support, intellectual property rights,” are acknowledged in a single line. Students' desires for personal relationships with their teachers and fellow students and concern for the university as a community are not mentioned among the “challenges” the online education proposal faces. (3) The third recommendation is to “expand use of self-supporting and part-time programs” (40) including UC Extension and professional M.A. programs, with a focus on “high demand disciplines” for which students are willing to pay top dollar. The third recommendation therefore echoes part of the second, in which online instruction is envisioned to be an appropriate venue for “self-supporting” programs. Many such programs already exist in the UC--in business, engineering, health sciences, and information science programs, for example. In addition to non-degree, certificate, and professional M.A. programs, a new part-time B.A. in “one or two general, interdisciplinary majors” is also contemplated. Again, these programs are imagined to be staffed in part by cheaper TA labor (41), and while additional TAships would help graduate students in the short run, substituting TA labor for faculty labor in a large program also reduces the ranks of faculty and so shrinks the employment prospects of those same graduate students. The part-time B.A. introduces a topic worthy of discussion--increased access for nontraditional students--but in troubling ways. Instead of furnishing nontraditional students with the full range of educational and research possibilities, it offers "general” degrees, even though the “admission criteria would be the same as current transfer requirements” (41). So even though this new body of part-time students would be as qualified as other UC transfers, it would be offered a reduced range of degree possibilities in return for fees “most likely . . . approaching non-resident tuition level” (41; my italics). The “underserved population” mentioned as an example is the “26% of the adult population” in L.A. County with “some college” (40). Now, the median income of that group is about $36,000 a year. Non-resident tuition is recommended to increase from $33,181 in 2010-11 to $36,027 in 2015-16 (89). Thus before financial aid, the “underserved” (but equally qualified) student who needs a part-time degree because she must keep working (p. 40) is here imagined to be the exemplary recipient of a reduced-option B.A. whose annual fee is equal to her annual income. The working group adds that “these programs can be designed to return a portion of the fees to financial aid,” but also that “to the extent that self-supporting programs generate additional revenues for academic departments, this improves access for students in the regular programs” (41). That "extent" would be small if the new B.A.s were structured financially like existing Extension programs; current non-professional Extension revenue is “relatively small--generating modest amounts above program costs” (42). But Extension courses are nondegree programs and presumably less valuable. So it is not clear whether the part-time B.A. would also generate only modest revenue (if financial aid was significant), or would extract it from a target group with a median income of $36,000. No justification is ever given for why part-time students equivalent scholastically to transfer students should be excluded from the full range of degrees. None of the social inequities involved are mentioned among the “challenges” to the proposal (42). (4) The fourth recommendation reads: “Develop a systemwide academic planning framework that incorporates campus goals within the context of priorities identified for the University as a whole” (46). A new way to coordinate planning systemwide might be useful, but it is not obvious what the working group envisions. An “assessment” program is part of it; would this be a standardized assessment of programs? How standardized? And used to what end by whom? The working group wishes to “establish and routinely update an integrated set of campus and system academic priorities” (48), but does not give a clue about how this would be done, who would articulate these priorities, and how the identification and articulation of priorities might involve the Academic Senate and other governance structures. As it stands, the specific disposal of budgets handed down to individual campuses, deans, and eventually units is left to the discretion of the local entities involved. The working group suggests that “budget cuts implemented by individual campuses during a year or two may not pose immediate risk to the systemwide academic profile, but the cumulative effect of such decisions over a longer period could be quite harmful” (48), and so suggests that a systemwide body wants some measure of control or oversight over how local entities distribute the budgets they are given. Local and centralized authorities may of course end up at odds, and it is not explained how conflicts would be resolved and what rights in the matter local entities would retain. An idea of “striking appropriate balance between campus/system interests” needs to say what balance is appropriate, and to confront the possibility that the interests of an entire campus could be de-emphasized from a central perspective. Instead, the working group introduces the notion of creating “an integrated set of campus and system academic priorities” without reference to the UC Master Plan or to existing long-range plans developed on each campus before the height of the global financial crisis. Since the question of planning process emerges in this section, it's worth pointing out that in practice the procedural form that dominates the entire document is that of the special “task force”--innumerable “task forces” are proposed to further develop recommendations that are general to the point of being obscure. But task forces are highly problematic exceptions to the structure of university governance. They are smaller, appointed, often oligarchic bodies that shape topics, deciding what's worth discussing and what’s not worth discussing, before proposals get to the properly elected bodies that eventually consider them. Justified as time-saving and convenient, they too often save us from the inconveniences of a more democratic culture. (5) Finally, although the recommendations on Education and Curriculum repeats throughout that proposals should be explored while maintaining “quality,” its final portion (pp. 49-54) demurs from explaining what “quality” means and instead “seeks UC input on its forthcoming recommendation on quality.” By deferring discussion of the criteria by which it knows its recommendations must be measured, the working group evades most consideration of the intellectual impact of its suggestions. The definition of quality devolves upon “metrics” yet to come (49), suggesting again that assessment methods may be a future area of contestation. Usefully, faculty are stated to be the arbiters of quality in their own fields. But the background document that comprises Appendix A to this last section, “Characteristics of UC Quality Courses, Majors and Programs” (52-54), operates at a level of generality that is unable to distinguish the University of California from any other college, and so does not bode well for the ability of current assessment procedures to provide directive criteria. So far, I’ve been reading the UCOF recommendations on their own terms and following UCOF’s presentation, but in fact its terms and presentation are part of the problem. As Christopher Newfield noted in his post on Monday, the content of the UC’s educational mission is set aside instead of being developed so that budgetary thinking might be organized to meet its principles. As it stands, when the profitability of a recommendation is being pointed out, and the phrase “support the University’s educational mission” is tacked on--as in “generate revenues and create workload efficiencies that support the University’s educational mission” (36, 37)—the statement becomes entirely circular, since no mission is ever elaborated except the optimization of assets. The recommendations on Education and Curriculum are above all evasive. They remarkably omit any consideration of connections between educational programs except when advocating the elimination of redundancy. Faculty opinions tend to be referenced under “challenges,” as they are called when the working group is afraid of faculty objections. Students' views of education and hopes for the UC are literally never mentioned, as though they did not exist. As it stands, even the financial advantage for instruction of the recommendations is obscure, because although it’s noted in several places that lucrative programs can help to fund less profitable ones, it is never said that they should. The document’s studiously impoverished account of what public education might be implies that a genuine account is somehow irrelevant. Its refusal to be articulate is so pervasive that it becomes the main message: the vision is that there should be no vision, and that no one should even have to say so. I don't like throwing that word around but I don't see any way around it here, having just read today's Funding Strategies Working Group (FSWG) report. Its genuine positive contributions are outweighed by recommendations of large tuition increases that embrace the current--failing-- higher education funding model without seriously considering the likely negative effects. A hasty overview: this section is 29 pages long, proceeds through dozens of bullet point observations, and offers 6 recommendations plus 3 others for "longer-term" consideration. As I'd feared yesterday, funding strategies are identified without discussion of educational goals. The first recommendation has become UC apple pie: build grass-roots support for UC as a "major priority for state funding" (p 73). I will return to the question of whether the effort described here could be successful. The second is also fine - more administrative efficiency - but its call for best practices does not identify or prioritize recommendations in numerous previous efficiency reports. In the apparent absence of clear ideas of its own, FSWG tosses the ball to the latest in a long line of consultants - Berkeley's Bain Consulting. Since UCOP has recently shown that about 3/4ths of UC employees are administrative staff, we really should be able to do much better than this. Savings on the system level are not to be expected soon. Recommendations 3 and 4 are very important: revise practice and policy on charging indirect cost recovery (ICR) for non-federally funded research, and improve ICR rates with federal research. Various Senate committees have been trying to understand research losses for at least a decade, and FSWG offers the first semi-official UCOP estimates that I have seen for how far short UC falls in covering the full costs of research. Usefully, the report acknowledges that UC is obligated to obtain "total cost recovery," and also acknowledges that it does not do this. In a major statement, the FSWG declares that ICR practices "are currently leading to the use of core-funds to subsidize this research in the range of more than $300 million per year" (p 84). It notes that federal grant ICR falls sort of that for peers, and that an increase of 5% would recover $150 million per year. Calculations that Gerald Barnett and I have done suggest that these are low estimates, but they total to more than half the over $800 million recent cut in UC state funding. The Report usefully notes that faculty misunderstanding remains a major obstacle to reform. Research is a vital public good and must be properly supported, but should be supported by sponsors, as is required by policy. Recommendations 5 and 6 are to replace student fees with tuition and to increase enrollment of non-resident students. The statements are mostly autopilot, made more annoying by the absence of any referencing or discussion of the large literature on declining access and attainment under the widespread "high tuition / high aid" model (I recently referenced some major work, which is not hard to find); and by an almost nonexistent acknowledgment of the need simultaneously to "protec[t] racial diversity" (p 93), which hardly does justice to the serious problems created by, for example, the pitiful proportion of African American students at the San Diego campus, among others. The University of Michigan continues to be touted as an exemplar, although its low-income student population as measured by Pell Grant eligibility is 1/3rd that of UC Riverside (p 96). What is new are concrete tuition dollar amounts and revenues under various scenarios (pp 89-92). The "low" increases (5% annually) get resident undergrads to $13,148 in 2015-16, and nonresidents to $36,027. "Aggressive" increases take resident undergrads to $20,721 by 2015-16, a further doubling of next year's fees, and nonresidents to nearly $40,000. So these eye-popping tuition hikes that erode if they don't wholly eliminate the public character of UC -- at least they would solve our financial problems, right? Wrong. The "low" increases net $445 million over five years, or about 1/8th per year of the $800 million cut. The "aggressive" increases net $1.63 billion over five years, or a bit under half of that cut per year. The same is true for the non-resident tuition plan - a significant shift away from the resident population for $174 million a year at best, and I've commented elsewhere on the problems with this idea at its best-case campus, UCB. Huge tuition hikes are supposed to end the "death-spiral" that Regent Gould described at the first UCOF meeting, but their established track record is poor. During the three decades in which high-tuition has formed the core of the American funding model for higher ed, and created widespread tuition envy among public university officials, the U.S. has lost its previous large lead over the rest of the world in college attainment, and has now produced the first generation that is less well educated than the generation before. One reason for this is simple: the post-war boom in attainment depended on mass access, and mass access came from low- to no-tuition schemes in public universities. If you look at where disadvantaged students preponderantly attend college, you can see that it still does. The FSWG proposes the abandonment of that model for the sake of revenues that are not sufficient to maintain educational quality, much less access. Acknowledging this, it calls simultaneously for a restoration of public funding, without acknowledging that the power to raise tuition regularly and faster than both inflation and economic growth is the main reason given by elected officials for the reduction of public funding over twenty years. In California, the Legislative Analyst's Office recommended against any increase in state funding this year (as proposed by the Governor) precisely on the grounds that tuition increases are a legitimate source of revenue. As tuition goes up, state funding goes down -- this is the history, and if we follow the FSWG, this is our future. Not to mince words, this doesn't sound like the cure for the death spiral, but the death spiral itself. This is a big week in UC admin. The Regents are meeting at Mission Bay in San Francisco, and the UC Commission on the Future is to hear its first round of ideas in the five main areas under study. A core question will be whether financial trends are driving UCOF's educational planning, or whether planning has some independence of thought. The separation of working groups could help, but freeing educational goals from immediate and systematic funding issues is a constant battle at UC, and it's especially hard to keep the institution's eye on education in our perennial state of fiscal turmoil. Nonetheless, most of the game consists in not tailoring UC to its current and currently imagined future means, a downsized version of 20th century mass higher ed that was struggling to keep up with changing public needs even before its budget got whacked. It's interesting to look at our notes on Jane Wellman's remarks when she appeared at the first UCOF meeting last September. Her ninth principle was, "if you don’t have attainment goals then the financial questions won’t work." You don't know what you need to pay for unless you know what you're trying to get. My translation is that if UCOF hasn't set goals that match future challenges and opportunities, and then pursued the right funding structure for them, the funding crisis will dictate shrinking goals. My impression isthat both funding and educational analyses have retreated into hundreds or even thousands of local discussions around the system. Everyone is helpfully offering patches and workarounds, and chairs of research centers and departments are gradually adjusting to a new lower normal by force of the absence of anything else. Folks aren't thinking big or circulating information to tie their issues to the overall picture. People feel a little embarrased imagining great public purposes although the state of California has never needed these more than now. Chairs and principal investigators whose units inevitably sit on a small piece of the UC labyrinth of side-deals special supplements and arcane cross-subsidies naturally see no percentage for them in transparency, which could subject their particular arragements to unwanted scrutiny. This is a recipe for the triumph of local financial self-interest over the larger mission. Unless there's momentum in the whole, each individual part instinctively tries to protect itself. The UC system desperately needs a moonshot vision from UCOF. If it provides even fragments of that, we should all take our turn filling in the gaps. It would be nice to have some good funding news for a change, but Washington is displaying a too-little-to-late syndrome that, if it continues, is going to stall higher ed recovery. The Chronicle of Higher Education's Paul Basken has a particularly through review of the state of the student-loan bill in Congress. The bill does continue to cut out the unaffordable private-sector banking middleman, for savings of over $6 billion a year even by the lower count offered by the Congressional Budget Office: "The legislation would end the bank-based system of distributing federally subsidized student loans, and instead would have the Education Department give all loan money directly to colleges and their students." Pell Grants would be indexed to inflation instead of eroded by it, as is current practice. But early-education program funding is gone from the bill, community-college assistance - the backbone of the Obama Administration's attainment recovery strategy-- is 20% of the original figure, interest-rate subsidies were cut so the rate starting 2012-13 is slated to be 6.8%, better than a credit card but not much better than the private lenders that students have been increasingly unable to afford. And the Pell Grant inflation adjustments are not scheduled to start until 2013. As with other Democrat proposals, the student loan bill is better than what we have but nothing like the ambitious, step-function investment that built public higher ed and that is needed to rebuilt it now. University of California administrators seem to have gathered around a singular verbal response to the variety of “incidents” that has rocked UC campuses in the past month or so. All such incidents, they say, are expressions of “intolerance and incivility.” President Yudof has issued a statement insisting that “It is also important that members of the university community conduct themselves with civility and with tolerance for the diverse groups that make up our campuses.” Chair of the Board of Regents, Russell Gould, reiterates the sentiment: “The University of California's commitment to diversity and tolerance for differing points of view is one of the hallmarks of its character.” To paraphrase Gandhi, robust diversity would indeed be a good thing. Chris’ recent posts on the budget and on the problem of accountability have provoked a series of productive responses by Bob Samuels and others (see the comments on Chris’ posts). There are important differences of tactics and analysis here: Does the chief problem lie in Sacramento or Oakland? What is the true nature of the crisis? Does UC have enough money to solve its problems already? How can we protect students from increased fees and a life in debt? Can we protect the Master Plan? And how best to explain to the State and the Public what the University does? Each of these debates, however, point to a larger question—one that Clark Kerr raised at the dawn of the “multiversity” but that UC leaders refuse to confront now: what are the uses of the University? Or what should they be? Part of the difficulty here is that UCOP and the Regents have embraced a managerial and corporate logic: whereas Kerr wrote about the University in terms of its functions, Yudof’s “hybrid university” is defined by its funding streams; whereas Kerr thought of the University as a small city of intellect, Yudof counterposes successful “businesses” with educational disciplines that don’t sell commodities. And whereas Kerr helped produce a state master plan, UC administrators for at least two decades have been treating public funding as a necessary evil compared to what they clearly consider the more prestigious private sector. The recent UCOP “clarifications” on administrative bloat painfully reinforce these problems. President’s Yudof’s individual and UCOP’s more formal responses to the Sacramento Bee’s editorial on excess administrative growth do little but highlight the fact that less and less of the University’s activities are related to its formerly central functions of teaching and research. The questions that have been raised concern the relative rate of administrative growth but Oakland places stress on the absolute numbers—thereby avoiding the fact that individuals in the “Managers and Senior Professionals” group have more than doubled. (UCOP, 6) It may be that the MSP category (and within that group “true” managers as opposed to other job classifications) remains small but compared to faculty percentages their growth is enormous. More serious, however, is the way that the administration treats the entire academic/non-academic distinction. Two points stand out. First, is the fact that more than half of the growth in UC FTE’s over the last decade has been connected to the Medical Centers (or what UCOP prefers to call the “Teaching Hospitals”). UC hospitals and medical centers do provide an important public service—that is not the problem. But their rapid growth and their centrality to the overall UC structure unavoidably distort and reshape the University as a whole. I don’t see how it is possible, for instance, that the effort and concentration needed to run the Medical Centers could not lessen the administration’s attention to the core functions of the University. I don’t see how it is possible that the fundraising that accompanied the growth of the medical centers could not compete with the raising of funds for central campuses. And more to the point, I don’t see how UCOP’s interest in and emphasis upon the “businesses” could fail to affect their attitude towards and effectiveness in securing state support for the University. There are only 24 hours in a day—priorities have to be made. Are the central campuses being sacrificed to support the Medical Centers? There are no answers on that issue from UCOP. But there is a second crucial point. The administration insists that the basic ratio of academic to non-academic employees has remained relatively constant over the last 10 years. Still, their data makes clear that the ratio between permanent and temporary faculty has altered significantly over the last decade. The numbers of senate faculty has not kept up with the increase in students, the percentage of permanent faculty has declined relative to lecturers and other teaching faculty (primarily in the hospitals) and the University has clearly shifted its hiring to temporary appointments. Whereas tenure track faculty accounted for 64.1% of the teaching FTE in 1997-1998 they only accounted for 59.1% by 2007-2008. (UCOP, 5). Nor do these numbers include graduate student teachers. None of these numbers are a surprise—but they do confirm a process through which the University is replacing tenure-track faculty with temporary faculty and graduate students. This transformation is one cost of the Regents and UCOP’s giving up on the state--they are gradually transforming the nature of the University without saying so. The question then becomes: do they have a commitment or a strategy to ensure that there is a permanent senate faculty in 10, 15, or 20 years? Or are they simply determined to lower labor costs by shifting over to a situation where no one has job security and they can decrease benefits? The dramatic expansion of the medical schools and centers, then, raise a very fundamental set of questions. To what extent has the expansion of the medical centers (and to a lesser extent the increasing emphasis placed on privately funded research) altered the very nature of the University? If in fact so many of the University’s resources (both in terms of funding and planning and attention) go towards the teaching hospitals and research then what are the costs to the rest of the University? What are the data on cross-subsidization between core funds and the Medical Centers or extramural research? In last summer’s crisis, the administration insisted that the medical center funds could not be used to help out the central campuses—although their explanations why were never that coherent. But what of the questions about how much of student fees and state funds are going to medical schools and "teaching hospitals"? To what extent are state funds earned by the less expensive departments funding the medical centers? How much do general funds and bond obligations support the independent researchers and research units. In other words it isn't enough to say that the teaching hospitals serve an important public function (which I would agree with) but at what cost to other public functions? Until the Regents and UCOP provide solid information on these questions they cannot claim anything approaching transparency on the University budget. I want to make clear that I am not seeking to disparage either the research function or the teaching hospitals. In fact, I remain skeptical of attempts to separate teaching and research when they are located in the same person or group. But what UCOP’s budget claims suggest is that all of us are in the midst of a transition that is leading to an ever greater separation of teaching and research and each from public service. If this transformation continues all of the employees will be losers—losers of job security, control over their work, and the ability to determine the value of their work (which will be increasingly reduced to a short-term utilitarian calculus). The University will be a shell of its former self, reduced to an appendage of outside financial forces, separated from the State, kept together only in the accounting imaginations of those looking at spreadsheets located in Oakland. 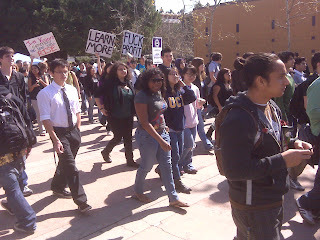 Students, staff, faculty and community members participated in multi-focal protests on the UCLA campus on March 4th. The day's events began at 7:30am with picket lines at several entrances to campus and ended with a late afternoon rally and march that brought K-12 teachers, students and other supporters of public education to the campus. Campus police were well behaved. A diverse group of students began marching around and through classroom buildings at 11:15am urging fellow students to walk out and join the protest. One protester pulled a sound system strapped to his bike trailer booming out music. By 11:45 this group had grown to about 100 and marched toward the Bruin Plaza rally. A separate rally organized by MEChA was gathering steam near the undergraduate library. For a moment it looked like the two groups would join together as cheers of solidarity went up. But that was not to be. From what I saw, the MEChA rally drew 100-150 students, and like the other group they marched throughout north campus, finally dispersing around 2pm. 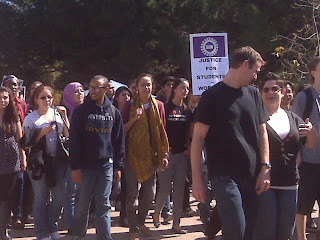 The noon-hour rally on Bruin Plaza drew hundreds of students, union members, lecturers, librarians and a faculty. The Daily Bruin reported the size of the crowd as 300. I would say it was well over 500 at its peak, shrinking as union members headed back to their jobs. In a bizarre twist, two men from the LaRouche organization had set up their literature table in the middle of the plaza before the protest began. During the rally they carried signs depicting President Obama with a Hitler mustache, and there were a few tense moments as others tried to block those signs with Day of Action picket signs. At the close of the rally, a large group marched up the hill toward main part of campus. They entered the Murphy Administration building without police resistance and went directly to the Chancellor's office. I arrived as the tail end of this march entered Murphy Hall. There were a number of union members, a handful of faculty, and many, many students (Daily Bruin reported 300). After much chanting and a musical/dance performance by students from the World Arts and Cultures program, one of the organizers announced that students were sitting in and had delivered demands to the Chancellor. Participants in the sit-in made themselves comfortable on the floor, and re-branded the women's bathroom in the corridor a "gender neutral" facility. For the next hour or so, students and staff took turns with the bullhorn. It was a diverse group: Latina/o, Asian, black and white. The overwhelming majority appeared to be students, along with perhaps 10 non-student union members & staff. Some told their personal stories of how the fee hike would hurt them or prevent their younger siblings from attending the UC. Others gave their own political analysis of the budget situation, or spoke about how activism in the past had brought about positive changes on campus (e.g., ethnic studies). Regular updates from protests around the state and country were read to the assembly. Two students arrived with petitions for the California Democracy Act, took a turn at the bullhorn, and then collected signatures. Another student sang a Mexican folk song, receiving much applause. The mood was upbeat but serious. Although this was not billed as a "Teach In," it had the feel of participatory education. I would estimate at least 70 people were present for this part of the Sit In. At some point, student leaders emerged from the Chancellor's office to report on their meeting with a Vice Chancellor. The report was that the Chancellor would not meet with students, and didn't need to give a reason why (here I'm paraphrasing the students' words). At 3pm there was a formal Teach-In in front of the undergraduate library, attended by about 150 people. When that ended, many participants marched back over to Murphy Hall to join the Sit In. When I visited Sit In at about 4:30pm there were still at least 50 people sitting down in the corridor, 4 UCPD guarding the door to the chancellor's office, and a few NLG legal observers. As Bob Samuels reports, at 4:30pm a second rally drew K-12 educators to the campus, and they too marched up the hill to join the sit in. However, by this time UCPD were blocking entrance to the building. After some time, according to a Twitter post last night, organizers cleared the Sit-In and joined the rally outside Murphy Hall to end the Day of Action. UC police were notably low key. No riot gear. No provocative confrontations or weaponry (that I saw). An article in the Daily Bruin quotes the police spokeswoman saying UCPD had met with the NLG in recent days to discuss their protest policies. Finally, I would say the organizers pulled off a very successful day of protest that dominated the main areas of campus for most of the day, and made the budget crisis very visible. Where September and November seemed like one-time, do-or-die events, March 4 feels like the beginning of something. The students here at UCLA better organized now, even if they are not quite united. They are linking their struggle nationally across college campuses, and out into the community via K-12 teachers and students. These nascent coalitions may be the best way to turn around the politics of privatization at the state and national levels. I don't know why it's always referred to as a "sleepy campus," but Neon Tommy has photos and video of protest action yesterday at UCI. Quick wrap up: 12 noon rally at the flagpoles-- very good speakers, articulate, impressive, able to address a wide range of issues from the poverty draft, to undocumented students financial aid, library cut-backs and lay-offs and tuition hikes for graduate students, lay-offs of workers, crippling student loan debt..the admin's false equation of civil disobedience with "racism and incivility." The crowd was angry, motivated and a bit at a loss as to what to do after circling Aldrich Park, trying to encourage by-standers and others to join it. A few leaders at the front led the hundreds onto Campus Avenue, stopping traffic at the footbridge. Some protesters were overturning garbage cans and putting them in the street. At 3 pm, students were back in front of Langson Library, still chanting. That's when I had to go home. This is the culmination of three days of rallies and actions at UCI. There were only three Irvine PD officers following the stream of protesters through Aldrich Park, but my students told me that police were on campus since 6 am yesterday morning. We are going to be editing together a short film of this week's events, and I will link to it here...The noontime flagpole rally saw well over 1500 in attendance -- the OC Register put the number at 800. Some higher education leaders are trying to head off protests by saying high tuition is good for poor folks because it means high financial aid. The San Jose Mercury News greeted Protest Day by finding a few people to sing the praises of high tuition as a Robin Hood "soak the rich" scheme to save low-income students from the injustice of low tuition. High tuition/high aid isn't a new system: it's the system that got us here (more students working 30 hours a week in school, booming debt etc to meet annual tuition hikes 4x the rate of inflation), and California is trying to catch up. High aid never covers the total cost of attendance. Students don't just pay fees. Even UC's numbers show an $11,000 gap for low-income students. A uniquely detailed statistical study found that low-income students have higher grants, and ongoing financial gaps, and higher loans, and larger loans with each additional year in school (Bowen, Chingos, and McPherson, ch 9). Fee hikes cause further public funding cuts: doubters should read the Legislative Analyst Office's report, which states that fee revenue means last years cuts need not be reversed. Public funding cuts mean poorer universities. Fee hikes replace only 1/3 of lost state money (Regent Gould's estimate), or 2% of current cuts to core operations (my estimate). Poorer universities mean lower educational levels. The most exhaustive statistical analysis of 100 years of US educational trends showed that after 1980 US attainment rates grew at half the rate that it had during the previous 30 years - exactly when "high tuition/high aid" took over private universities and many flagship publics (Goldin and Katz, e.g pp. 19, 334). Lower educational levels mean lower productivity growth, more inequality, more social problems. Sound familiar? We've already been to the promised land of high tuition and high inequality. Now we're trying to get out. The US had the best educated population for the first 3/4ths of the 20th century because its schooling was egalitarian. It rested on public funding, public provision, decentralization, gender neutral, open, and "forgiving" (Goldin and Katz, ch 4). Renewed egalitarianism is the only way out and up. We need a new public funding model for higher education. That's one of the things today's protests are about. Recent events across the University of California—at UCSD, at UC Irvine, at Berkeley, and perhaps even more broadly at UCLA, at Riverside, at Santa Cruz, have been lumped together by top university administrators, even if the events are linked together in ways completely belying the administrative default position. Of late, the Muslim student protest against Israeli Ambassador Oren at UCI has been equated with the racist expressions by three separate groups of students at UCSD. For the University leaders, protest itself appears to have become incivility, disruptive of dominant institutional arrangements and even at times, for some criminalizable. And free speech is to be upheld only when expressing certain positions but not others, disrupting the peace—a criminal misdemeanor—a characterization of an activity reductively in the case of speaking truth to power but not in invoking power to fix or sustain a regime of truth. And pretty much all of the expressions in question are collapsed as “uncivilized” and “despicable” no matter their very different objects of criticism and genealogies of initiation. Where the university should stand for careful distinction it has opted largely for totalization, where it should be committed to nuance and thoughtful consideration it has opted for a blunt bludgeon, where it should stand against racism and stand up for vigorous free expression and critique it has generally ignored the latter save in moments of unusually public pronunciation (such as the current events at UCSD) and undercut the former. Instead of addressing the critical issues the University has characteristically bundled them all together, infantilized the criticism and soft-pedaled on the racism, criminalizing protest and reducing racism as if it were the mere expression of epithets rather than a historical medium of power and subordination. In short, the University once again diminishes racisms to the more or less innocent ignorance of youthful indiscretion, individualizing the transgression once again as the work of a bad apple or two. It has shown far more concern for the public relations fall than with the social conditions under which students of color—those who continue to attend UC despite the repeated demonstration of inhospitability—continue to exist. UCI has just thrown limited resources at the questionable PR firm, Alan Hilburg and Co, to ensure its image is not tarnished by these events rather than using the funds to maintain staff in the face of demoralizing budget cuts or to create thoughtful programming around the issues in question. The crisis at the University of California is as much one of leadership as it is of the budget cuts we continue to suffer through. There are four sets of recent events across UC that are worth distinguishing. The first concerns student protests, including sit-ins, regarding the fee increases and budget cuts. Here Berkeley has been the focus campus even if other campuses have seen significant action too. Second, there is the case of protesting a speech of Israeli Ambassador Oren by members and UCR supporters of the UCI Muslim Students Union, repeatedly disrupting but not preventing him from completing his speech. Third, there is the case of racist expression at UCSD, involving members of a fraternity, a campus supported student radio, the hanging of a noose in the Geisel Library on campus by a senior and at least two of her accomplices, and as recently as yesterday a pillow-case shaped as a KKK hood placed over a statue’s head outside the Library. And fourth--I want to insist that this is a separate consideration—the significant protests among UCSD students, staff, and faculty of the long trajectory of racial conditions on campus. It remains to be seen whether this latter movement—which insists on connecting the campus racism to the budget crisis, linking budgetary transparency with demands for racial equity, public access, and the public good—can sustain itself.